The VC's Indigenous Research Fellowship is a research-only fellowship position, the result of a partnership between Oorala Aboriginal Centre and Research Services. The aim of the fellowship is to provide support to an Aboriginal researcher to successfully complete their PhD and produce high-quality research. 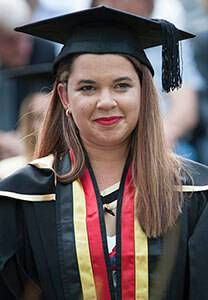 Brooke Kennedy is a Glen Innes local who graduated with a Bachelor of Science with Honours from UNE. Brooke is currently working on her PhD at UNE entitled: Improving Management of Free-roaming Dogs in Remote Indigenous Communities. She is part of a team of researchers called the Canine and Equine Research Group. “I’m the first of my family to attend University and wouldn’t have been able to do it without the support I received from Oorala Aboriginal Centre,” Brooke said. “I missed out on an Early Entry program into UNE and instead, enrolled in an alternative entry program called the Internal Selection Program (ISP) with Oorala in 2010. “Oorala provided advice and support and guided me through the process of how to apply to Abstudy to fund my travel, meals and accommodation while in Armidale for the ISP assessment day. They also helped me find and pay for a maths and geology tutor in my first year."